By now you have seen the powerful impact of Instagram’s visual appeal it has on businesses. If you have not set up your Instagram business account yet, or are new to the whole social media phenomenon, you should know Instagram has nearly 400 million active users and is growing at rapid speed. If you want to consider if the platform is good for your business, here are some killer benefits of using Instagram advertising to gain brand recognition and online appeal. While most businesses prefer to use Facebook and Twitter to connect to followers, Instagram has one of the most active and engaged bases. It generates more engagement than Facebook and Twitter. It is one of the most viable and profitable platforms to be on, and it is time for businesses to take maximum advantage of it. Connect with your customers, build relationships, share your product and service and listen to feedback. Learn what your audience likes. People are already sharing what they like on Instagram, whether it is their work, family life, social life even pets and hobbies. This gives you a sense of understanding on what your audience seems to connect to the most. The more you understand where your audience is coming from the easier it will be to relate to them. So begin sharing similar things, for instance, if you figure out a certain section of followers enjoy eating a certain type of food, visit the same place and post an image of you enjoying the same thing. This will make you seem relatable to your followers. You can discover new people and places through Instagram. Use hashtags to learn what your followers are up to. Hashtags is an excellent way to find potential customers. For instance, if you run a small clothing boutique, use hashtags to find people who like the type of clothes you sell, or even other similar businesses that are located in the same area. Remember, these businesses too will have their own customers who may like to check out your place, if you target a similar audience. Create content and share on other social media channels. 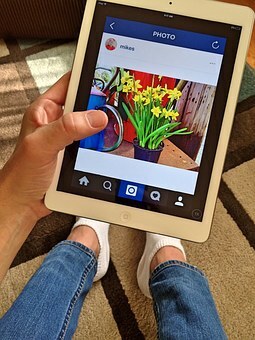 Content created on Instagram can be shared on different marketing channels. You can also use the same content on email marketing campaigns. Email blasts are a great way to make regular contact with your followers, especially in the instance they don’t appear frequently on their Instagram pages.